Thanks to the user MaVeRicK who helped me find a way to separate the models from the original files, now when installing the base files the head will be kept only for this suit and the other suits of the game will not be affected, for this install the files standard base 1.1. If you wear red hair you should also upgrade to version 1.1, likewise you should update Beautiful Reality Face 2.0 For Darkside Costume. You can check the changelog for more information on updates. Thank you in advance for the support, the mod to liked and this is the biggest reward for the work done. Regards! I hope you enjoy these modifications, it has been an arduous job, a gift from a fan for fans, I would love you to upload images with your favorite Dark Side Costume personalization. I'm going to take a well-deserved rest! On some known errors in the models. 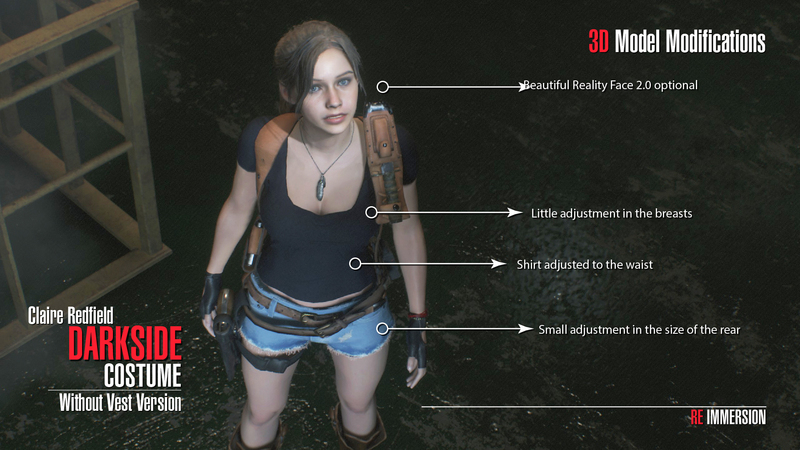 The problem is that the RE engine has some strange features to work properly, including that it uses five models of different quality that are affected in different ways in different circumstances, including light, distance, etc. Another factor is the handling of normal maps, for now the modders use a script that created 777 to import files, and has some errors, including how objects and the aforementioned normal maps are affected. In some elements it works correctly and in others it does not, one of them is the belt, the front works very well, but if you look closely at the fannypack you see errors, I have tried to handle and edit normals taking polygons independently but I have not achieved good results, what you see in the mod is the result of several tests and find that in the end is the best way possible with the limitations we have the modders at this time. When you see mods that exchange parts or changes in color or texture, they look correct because they are not modifying 3D models. Another factor is how ambitious I was when creating the mod, by giving so many options this means that I had to edit too many models, not just two or 4, actually there were 16 different models to generate all the content, and make a change in one involves changing Everyone else. For that reason, it took almost a month to free himself. I do not think I'll do such an ambitious mod again, for now, I'll concentrate on doing some little ones that I have in mind, some DLC for the DarkSide Costumes and a special surprise next week. Finally, after more than 100 hours of work, I can release the Darkside Costume without a vest. This mod includes several texture and modeling options, watch the video and images for more details. I thank you in advance for informing me of possible bugs, since there are so many files it is very difficult to test and control everything. The bugs that have been reported have already been uploaded. Watch the video to know all the features. 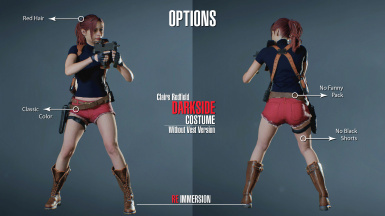 These same options were added to the version with vest, to download and update the previous mod go to the original page of the Dark Side Costume mod﻿. There is an exclusive version of Beautiful Reality Face for the standard versions that have high neck. You can download it here﻿. 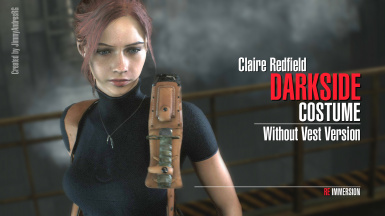 I have also added a version of reddish hair for claire that you can download here﻿. Each version has its own miniature in the suit selector. There is a problem in the versions without Black Shorts that when the legs bend too much you see a hole in the top, I found the fault and this will be added to all the NoBlackShorts versions. I plan to add some DLC for this mod, like versions without a front knife and one that I love, rockstar pantyhose! If you choose the Standard version that has the high neck, this will make the head replace in the other suits of the game, this is because there is only one head model shared among all the suits. You can use the neckless versions if this seems annoying. Do not use opposite versions of this mod, that is to say, use only Standard versions, both with a vest and without a vest, or versions Neckless, both with a vest and without a vest, do not mix. 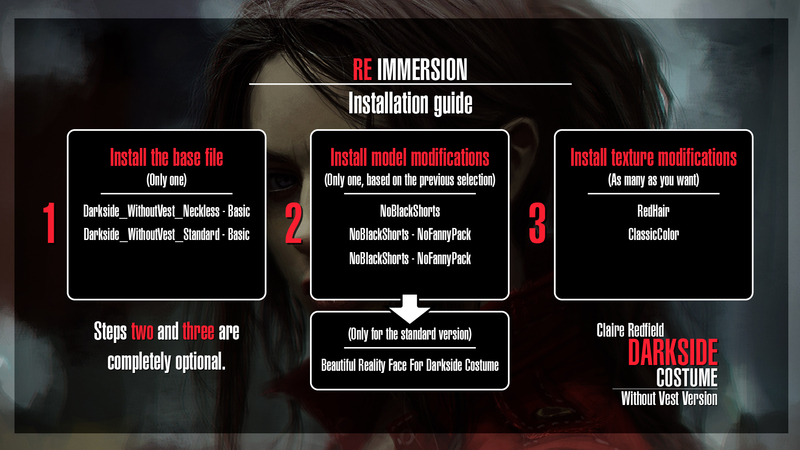 If you install the two suits in the same versions, and in the options of the game choose classic suits when Claire covers Sherry with her vest will be reflected the change of suit. Darkside_WithoutVest_Standard - NoFannyPack -1.0: This file was uploaded again, it contained the wrong file. Darkside_WithoutVest_Neckless - NoFannyPack -1.1: I had an error in the 3D model that showed errors in the animations and the shorts made a clipping effect. Darkside_WithoutVest_Standard - Basic -1.1: This update allows the head to be maintained only for this suit and the other suits of the game will not be affected. It requires updating Red Hair for Darkside to 1.1 and Beautiful Reality Face 2.0 For Darkside to 1.1 in case you are using them.